Take a bit of your seaside vacation home by making a "beach in a jar" craft. 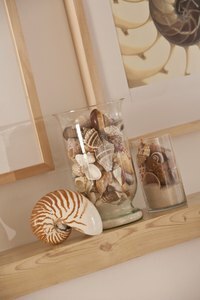 Use your seashell collection, along with white or golden sand, to create eye-catching home decor. A seashell- and sand-filled jar is an inexpensive way to commemorate a family beach vacation or a romantic honeymoon. Not only will the craft be more affordable than a store-bought souvenir, it will be more memorable and sentimental as well. Choose any size glass jar to hold the sand and seashells. Pick a clear glass jar for easy viewing, or a turquoise glass version to reflect the color of the ocean. Use a glass cleaner and soft cloth to remove any fingerprints from the jar. Stand the jar upright on a flat surface. Fill 1/4 of the bottom of the jar with sand. Insert the seashells into the jar. Use small or large seashells, or a combination of both, depending on the size of the jar. Add accent pieces such as driftwood or sea glass to the jar if space allows. Write the name of the beach the seashells and sand came from, or the location and year of the vacation, on the jar using a paint or glitter glue pen.